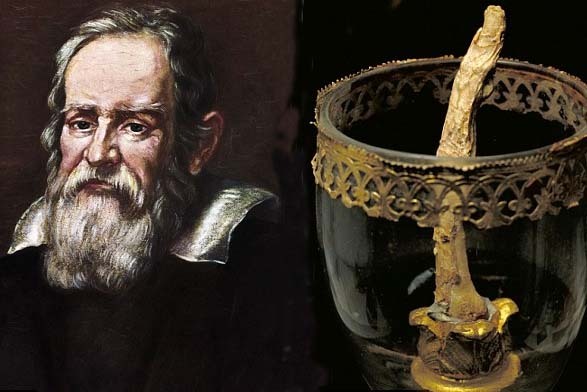 Several body parts of the astronomer Galileo was stolen in 1905. They were earlier cut from his body by the Vatican, when Galileo was buried 95 years after his death. This is supposed to be the finger of astronomer Galileo kept for display in Florence, Italy. An art collector has found a tooth, thumb and finger of the famous renaissance astronomer Galileo that had been missing for more than a century. The body parts, cut from his corpse when the Vatican finally allowed the controversial Italian scientist a church burial 95 years after his death in 1642, vanished in 1905. 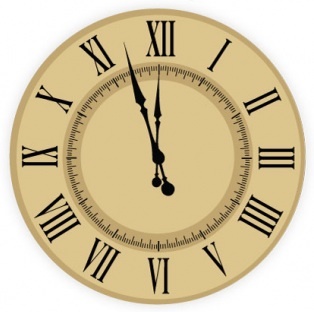 But they appeared at a recent auction as unidentified artefacts contained in a 17th century wooden case. 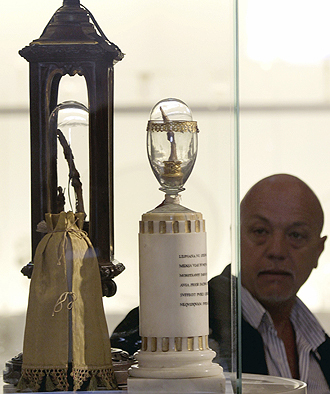 The unnamed collector who bought the relics suspected they might belong to Galileo. Galileo is considered the father of modern science. Now his finger is put on display. 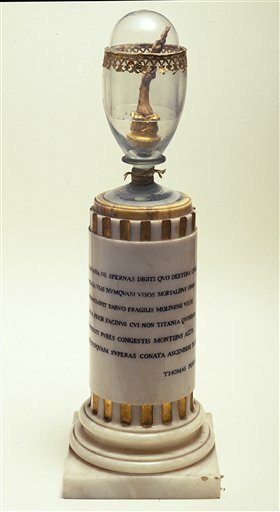 The finger of astronomer Galileo is kept for display in Florence. 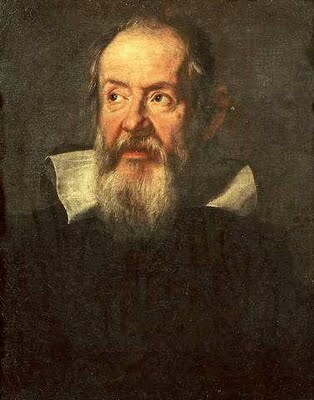 The relics of Galileo is not to be found in his tomb. There some body parts will be missing. Experts at Florence’s History of Science museum compared them with another finger and vertebrae also cut from the scientist and confirmed they were indeed Galileo’s. W hat is the story behind the relics of Galileo, and his relationship with the Roman Catholic Church? 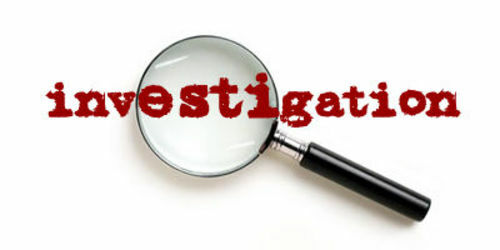 Lets do a proper investigation. The relics are now kept for display in Istituto e Museo di Storia della Scienza di Firenze. “All the organic material extracted from the corpse has therefore now been identified and is conserved in responsible hands”, a spokesman for the museum said. The relics will be exhibited from early 2010, when the museum will re-open after current renovation work and will change its name to the Galileo museum. 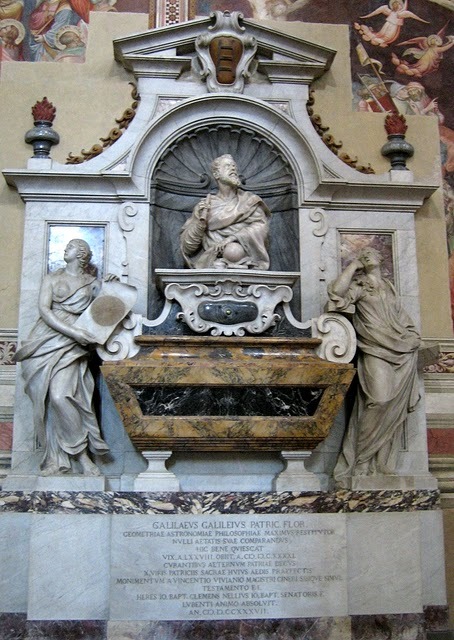 The Tomb of Galileo at the Basilica of Santa Croce, Florence, Italy. Galileo, born Galilei Galileo at Pisa in Pisa in 1564, is considered one of the fathers of modern science. His achievements include developing the telescope and observing that the Earth revolved around the Sun. But he became an enemy of the Catholic Church, of which he was a member, by challenging its teachings. Clerics eventually denounced him to the Roman Inquisition in 1615 over his support of a heliocentric, or Sun-centered, view of the universe. Although he was cleared of any offence at that time, the Church condemned his belief as ‘false and contrary to Scripture’ and Galileo promised to stop publishing it. In non of the paintings of Galileo there is a smile. So its impossible to see if the found tooth really is his. 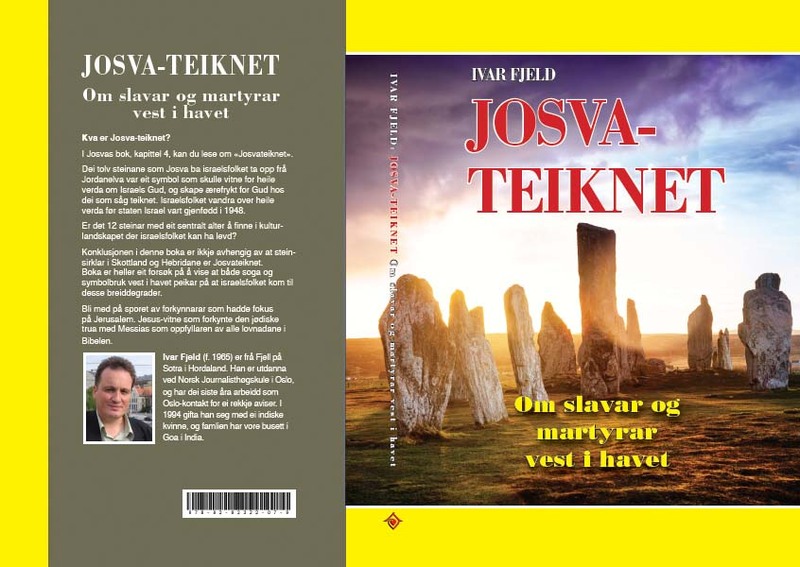 But in 1632, when he defended his views in his most famous work, Dialogue Concerning the Two Chief World Systems, he was again tried by the Inquisition. It found he was “vehemently suspect of heresy” and Galileo was forced to recant and spend the rest of his life under house arrest. However, following his death, evidence for a heliocentric universe became so overwhelming that the Vatican’s opposition gradually buckled. By now because he was so revered, it was decided that parts of his body should be removed and preserved for posterity. Giovanni Targioni Tozzetti, a science historian who cut away the parts and wrote about the ceremony, ‘confessed he had found it hard to resist the temptation to take away the skull which had housed such extraordinary genius’, the museum said. The newly-found relics had passed from one collector to another until they went missing in 1905. The remaining finger and the vertebrae have been conserved since 1737 in a mummified state in museums in Florence and Padua. Galileo was rehabilitated by late pope John Paul II in the early 1990’s. The removal of a tooth from the astronomer Galileo’s body raises a lot of questions. 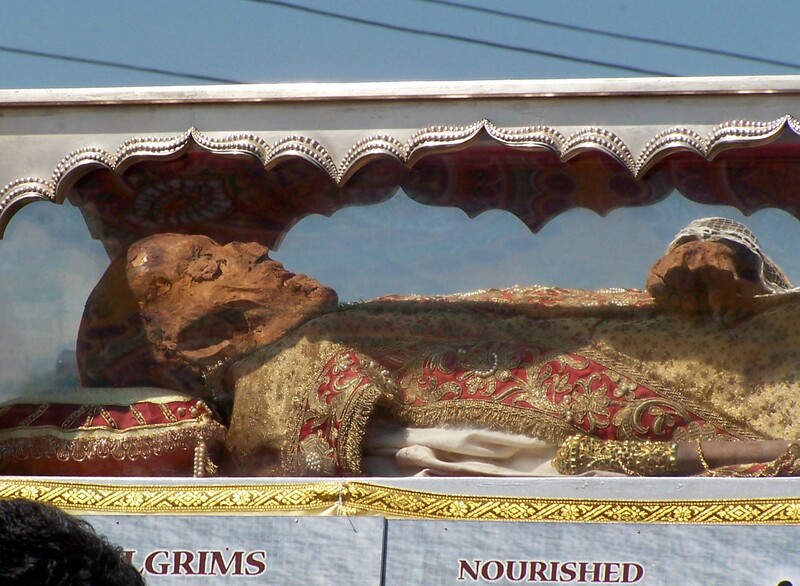 The Catholic Church claims there was a robbery of these relics in the year 1905. 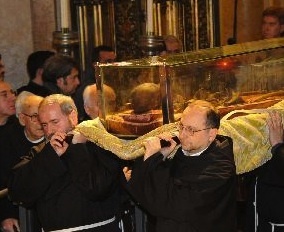 I am not sure who is the rightful owner of the dead body of a man that was excommunicated by the Vatican. And since Galileo was excommunicated, and spoke out against the Pope, how come his teeth can be holy? Since Galileo was pardoned 95 years after his death, we all must wonder if this tooth became holy before of after the skeleton was moved to a Roman Catholic grave yard. The not so holy false teeth of Winston Churchill. What happens to holy items when they are robbed? Do they loose their holiness? What about the robber. 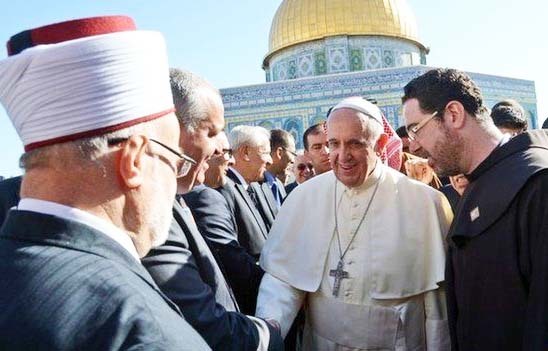 Can he become holy when touching and kissing such holy items? If the Pope can not answer such question, I feel we need to go an consult a dentist. 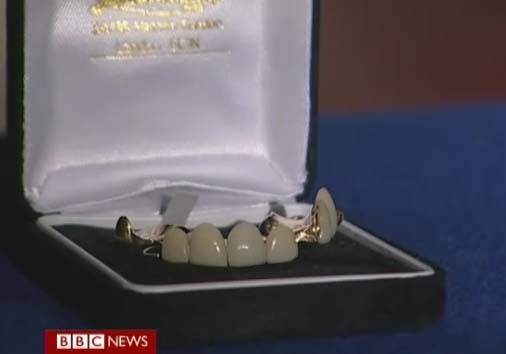 I just read that Winston Churchill’s false teeth was sold for over USD 23,000 at an auction. Since I am a living saint, It might be interesting to know the value of one of my tooth. OMG!! I am simply amazed as to where you get all this information from. 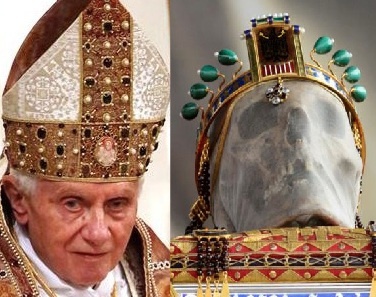 I thought I had read and laughed enough about the St. Anthony’s tongue and other Catholic “madness” now they they have come up with Galileo’s finger? This is hilarious! And Winston Churchills teeth? yewww, my stomach is turning LOL!! 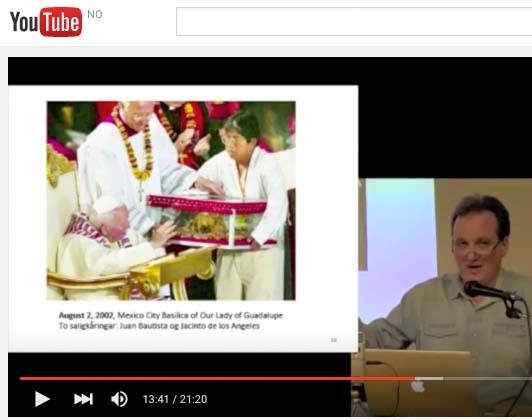 I can’t stop laughing – I’m curious to know what else is in the Catholic Closet!! Thanks for the info, what a laugh!! 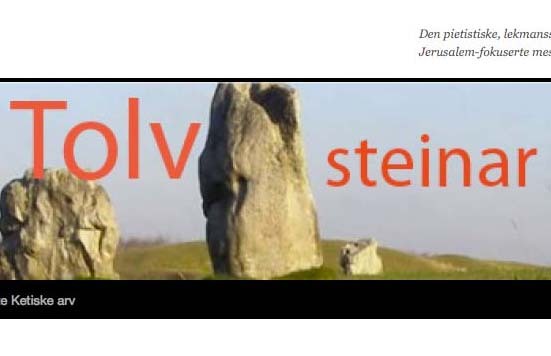 Shalom on Yom Kippur, and thanks for commenting. 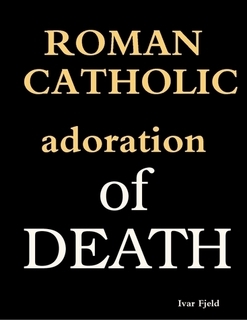 Since half of my family is Roman Catholics, I have gone deep into the roots of their faith. What I have found is disturbing. There is more in the pipeline. I had a feeling you might close the post after my last message. I was not here to have a debate but maybe you are. It seems pretty insincere of you to not consider with an open heart a truthful view of Islam just because of predujice you hold towards Islam and Muslims. I hope that one day before your time is up you do consider sincerely what I have said. The fact is that without Prophet Muhammad (saw) coming there would have been far less people who would worship the one true GOD and love Isa(as). And we muslims vie with you in love for Isa(as) but we love our creator more. Excepting Islam does not mean you cease loving Christ. 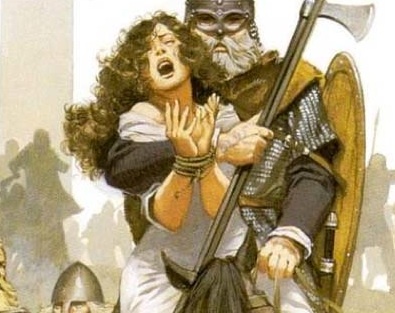 If he came tomorrow in the flesh like he is going to come, and the Muslims join him to fight the antichrist will you then at least join with us in this. You probably wont post this comment ( not relavant to the topic at hand) but at least you will read it inshallah. You were wrong about me not publishing your comment. But you are right. Your comment is not relevant, to the article you have read, at least should read. 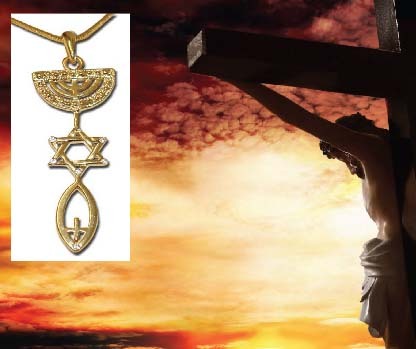 This is one of many articles that explains why the Pope and the Vatican do not follow the Bible, and the instructions of Jesus. But there are other articles about Islam on this blog, and you are free to keep on commenting. I can not convince you that Jesus is God. Salvation belongs to Him. He has to send His Holy Spirit on you. It is my experience, that many Muslim who have come to faith in Jesus have had wonderful experiences of vision and dreams. I hope and pray you will have such. Who says Jesus is coming back in the flesh? He came in the flesh already as the lamb of God. The next time he comes will be as the lion of Judah. Do not think it will be in human flesh. When he comes next time his enemies will hide themselves in mountains and pray to the mountains that they fall on them that they hide them from him, but they will not escape. Every eye will see him including the dead. So something big will happen. Now the spirit of antichrist is disbelief in Christ. To destroy antichrist will be removing all doubt of who the creator is. Hard to say how that will happen but since the human body is likened to a temple of God. The Jewish temple designed by God and was to portray his plan of redemtion. So like the veil or seperation between God and man was rent in two, all will see him and know him, and those who doubted him will be ashamed. This verse clearly talks about “His feet”. Well, now. That is just ridiculous. How so? Who are we talking about here but the creator of the heavens and the earth. Power over life and death, keys to the bottomless pit? Because it goes beyond the norm you call it rediculous? Was it rediculous that Jesus had power to command the ocean and it would listen? Most people seem stuck in the idea that religion is all about this world, never think past human. You last message is not easy to understand. Do you say that Sue is wrong, that what the Vatican has done by putting its finger down in Galileo’s grave is not ridiculous? Oh…, no I don’t disagree with Sue. Very odd but typical of the Catholic church. I think it falls in the category of vain glory, passing praise amongst themselves, one to another. Like putting a multi million dollar price tag on a davinci painting, magnifies their own.